I woke up at war. With demons chasing me for being God. Realize that the fight we are in is a holy war. You are on the side of the divine or the devil. If you want to thrive or your children to survive you must fight first and fiercely. Liberation is to be taken by force. pink terrorists prefer to be in power through illusion even though they are the minority. This year their privilege card has been revoked. Know there is only #BlackPrivilege. Next #2RAW4TV we will talk about when the tide had turned for Black people and how they will keep on winning. 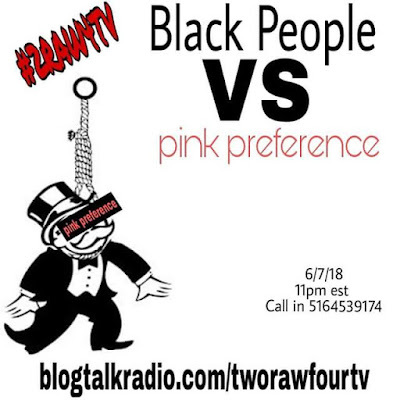 It is always Black people versus pink preference, we don't care what you prefer!